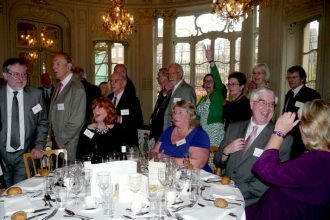 Since its inception at an informal lunch in the old Research International offices in late 2002, the Network has held Spring and Autumn Lunches each year and Christmas Party (incorporating the AGM). A Summer Party was introduced in 2005. The Spring and Autumn Lunches are held at a variety of different venues. The Summer Party was initially held at the Auriol Kensington Rowing Club in Hammersmith, and since 2010, at Doggett’s Coat and Badge in Blackfriars. To date, the Christmas Drinks and AGM have been held by kind permission of TNS at their offices. Pictures of recent and past Research Network social events can be found in the Gallery section. The Photo Archive page contains a selection of pictures of each year's events, from our first Spring Lunch in 2003, to the present day. Autumn Lunch: 14th October, Tas Restaurant, Borough High St.